What Is The Estimated Shipping Period? What is Your Return, Refund and Exchange Policy? You might already know it, but, we really like offering up discount codes. In addition to the discounts we email to you, you can earn more by creating an account with us and logging in with every purchase. Also, interacting with us on social media can also help gain a couple extra hundred points! * Next up, you'll be brought here to get your shipping details entered. If you have an existing login account and have already logged in, this information will be filled out for you. If anything has changed, update your account to see permanent changes, or edit here for temporary changes for this one order. ** If you're new here, don't fret! Enter the email address you use frequently and that you'd like to receive order details & shipping confirmations sent to. *** Then, off to the right-hand side of your screen, you'll see a spot to enter a discount code of your choice. Discount codes can only be added one per order, and can't be applied to subscription orders. 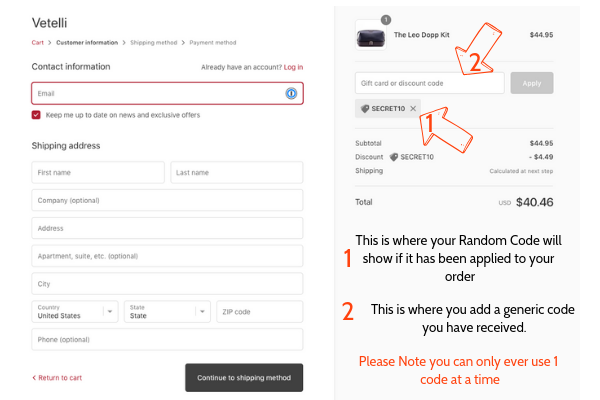 Discount codes will only expire once they've been applied, so if you're sitting on a couple of discount codes, don't worry about losing out; you can always use the unused code to any other one-time order. **** Once the discount is applied, you'll see the difference deducted from the total. The, click to continue with the shipping method.